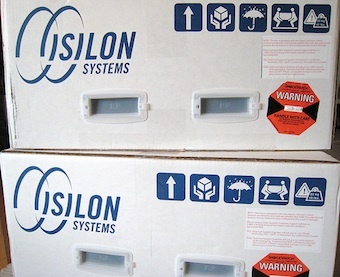 Isilon Packaging by ChrisDag (cc) (from Flickr)”] Intel announced today that they are going to acquire the InfiniBand (IB) fabric technology business from Qlogic. From many analyst’s perspective, IB is one of the only technologies out there that can efficiently interconnect a cluster of commodity servers into a supercomputing system. Recall that IB is one of three reigning data center fabric technologies available today which include 10GbE, and 16 Gb/s FC. IB is currently available in DDR, QDR and FDR modes of operation, that is 5Gb/s, 10Gb/s or 14Gb/s, respectively per single lane, according to the IB update (see IB trade association (IBTA) technology update). Systems can aggregate multiple IB lanes in units of 4 or 12 paths (see wikipedia IB article), such that an IB QDRx4 supports 40Gb/s and a IB FDRx4 currently supports 56Gb/s. The IBTA pitch cited above showed that IB is the most widely used interface for the top supercomputing systems and supports the most power efficient interconnect available (although how that’s calculated is not described). Where else does IB make sense? One thing IB has going for it is low latency through the use of RDMA or remote direct memory access. That same report says that an SSD directly connected through a FC takes about ~45 μsec to do a read whereas the same SSD directly connected through IB using RDMA would only take ~26 μsec. However, RDMA technology is now also coming out on 10GbE through RDMA over Converged Ethernet (RoCE, pronounced “rocky”). But ITBA claims that IB RDMA has a 0.6 μsec latency and the RoCE has a 1.3 μsec. Although at these speed, 0.7 μsec doesn’t seem to be a big thing, it doubles the latency. Nonetheless, Intel’s purchase is an interesting play. I know that Intel is focusing on supporting an ExaFLOP HPC computing environment by 2018 (see their release). But IB is already a pretty active technology in the HPC community already and doesn’t seem to need their support. In addition, IB has been gradually making inroads into enterprise data centers via storage products like the Oracle Exadata Storage Server using the 40 Gb/s IB QDRx4 interconnects. There are a number of other storage products out that use IB as well from EMC Isilon, SGI, Voltaire, and others. Of course where IB can mostly be found today is in computer to computer interconnects and just about every server vendor out today, including Dell, HP, IBM, and Oracle support IB interconnects on at least some of their products. With Qlogic out I guess this leaves Cisco (de-emphasized lately), Flextronix, Mellanox, and Intel as the only companies that supply IB switches. Mellanox, Intel (from Qlogic) and Voltaire supply the HCA (host channel adapter) cards which provide the server interface to the switched IB network. Probably a logical choice for Intel to go after some of this technology just to keep it moving forward and if they want to be seriously involved in the network business. IB use in Big Data? On the other hand, it’s possible that Hadoop and other big data applications could conceivably make use of IB speeds and as these are mainly vast clusters of commodity systems it would be a logical choice. There is some interesting research on the advantages of IB in HDFS (Hadoop) system environments (see Can high performance interconnects boost Hadoop distributed file system performance) out of Ohio State University. This research essentially says that Hadoop HDFS can perform much better when you combine IB with IPoIB (IP over IB, see OpenFabrics Alliance article) and SSDs. But SSDs alone do not provide as much benefit. (Although my reading of the performance charts seems to indicate it’s not that much better than 10GbE with TOE?). It’s possible other Big data analytics engines are considering using IB as well. It would seem to be a logical choice if you had even more control over the software stack.